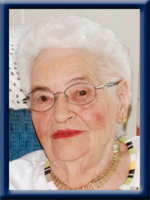 SWAIN – Frances Pauline, 94, of Port Mouton, Queens County, passed away on Sunday, July 27, 2014 at North Queens Nursing Home, Caledonia after a brief illness. Born on September 1, 1919 in Central Port Mouton, she was a daughter of the late Clifford and Civilla (Leslie) Payzant and was a direct descendant of the Reverend John Payzant. Frances married her husband John on December 26, 1938 in the old parsonage in Port Mouton and lived in Central Port Mouton for most of her life, except for a short time in Halifax after the war. She lived nearly ten years at Stonehaven Lodge in Port Mouton owned by her nephew Tim Rudderham. She shared a special bond with her sister Catherine who also resides there. She was a former member of Port Mouton United Church, sang in the choir and belonged to the U.C.W. She was an exceptional homemaker and an excellent cook. She enjoyed knitting for her family, watching soap operas, playing 45’s and visits from family and friends. She is survived by her sons John (Pat) of Bridgewater, Robert “Bob” (Louise) of Port Mouton, grandchildren Eric (Jolyn) of Halifax, Chris (Corinne) of Bridgewater, Nancy (Dane) Grant of Hebbville, great-grandsons Sam and Malcolm Swain and Eoghan Grant, sister Catherine Rudderham and sister-in-law Ola Payzant. Several nieces and nephews. She was predeceased by her husband of 66 years, John, her sister Ruth Wagner and brothers Gordon and Cecil. Cremation has taken place under the direction of Chandlers’ Funeral Home, Liverpool where visitation will be Thursday, July 31, 2014 from 2 p.m. until 4 p.m.. A private family graveside committal will take place in Peaceful Hill Cemetery, Central Port Mouton. Donations may be made to Peaceful Hill Cemetery Fund, First Responders Port Mouton, or charity of choice. Online condolences may be made to www.chandlersfuneral.com. The Swain family would like to thank all those who have cared for and visited our dear mother over the years. We are saddened to hear of Frances passing. Her loss will be felt by all those who knew her. Frances was a very lovely and always neatly dressed, use to enjoy my visits with her. She was a good friend to my Mom, Jane Fisher. Memories are made to hold onto. RIP Frances. John,Patsy and families,,so sorry to hear of the loss of your mother. May her gentle soul RIP. Bob, Louise, Nancy x & family- Take comfort in your memories. So sorry to hear of your sister, Frances, passing away. Although I didn’t know her, I had heard Boo speak of her many times. Hope all is well with you. Our thoughts and prayers are with you at this most difficult time. To all of Frances’ family: we are so sorry to hear of the loss of your mother(grand mother),she was a lovely lady and a great person.Our condolences to you all on your loss,she will be greatly missed by everyone who had the pleasure of knowing her over the years.Always remember the good times. Our sincere condolences to the Swain family. Frances was always such a smart lady and much loved community member. My Mom – Jane Fisher – loved to visit her and Catherine at the Lodge as well as the other residents. May your memories give you peace at this sad time. God Bless. Our condolences to you both on the loss of a sister and aunt.We know you will miss her terribly. Sincere sympathy to Frances’s family . I have known Frances for a good many year’s .Lovely lady . Alway’s had that beautiful smile . She will be missed by her family and all who knew her . Sincerely Brenda Lawrence . Sorry to hear about your Mom’s passing. Our condolences to you both. Please accept my deepest sympathies for your loss; my prayers are with you and the family during this difficult time. We were so sorry to her of your mother’s passing. Please know that you are in our thoughts. So sorry to hear of your Mom’s passing. My thoughts are with you. I would like to extend heartfelt sympathy to the family of the late Frances Swain. We were very sorry to hear of Frances passing. Sincere condolances to all the family. So very sorry to hear of your Mom’s passing. My most sincere sympathy. My thoughts are with you. John & Pat – So sorry to hear of your moms passing. She lived a long life so you can be thankful for the many memories. John,Bob,Catherine and families: Sending Sincere Condolences on the passing of a lovely lady. always enjoyed my visits with frances as a home support worker. she will be truly missed. prayers are sent to all the family at this sad time. John we were saddened to read of the passing of your Mother. We want you and the family to know our thoughts and prayers are with you. So sorry to hear of Frances’ passing she was a lovely lady. Always nice to talk to her during my Home Support visits, she always spoke with such fondness and love of her family. She will be missed. We express our sympathy on the loss of your Mom. She will be missed. You are all in our thoughts and in our prayers. Bob I am sorry to hear of the loss of your mother We are thinking of you at this sad time. Our thoughts are with you as you celebrate Frances’ long and well-lived life. You must have so many wonderful memories of her to share with your families and friends as you gather today. To all of Frances’ family. We were sorry to hear of her passing. She was a lovely lady. Remember all the happy times to help get you through your time of sorrow. Sorry to hear about Aunt Frances. I know you will have many fond memories of great times and family gatherings in Port Mouton. Frances was such a great part of those. Best wishes and our thoughts are with you at this time. On behalf of the Maritime Conference United Church Women, deepest sympathy to Frances’ family and friends at this time of loss. Loved ones remain in your heart and in your memory; that is a treasure you will never lose. As people of faith, it is a great comfort to know that the love of God surrounds us always. God shares our joy. God feels our sorrow. God helps us to find strength to carry on with the routine of life and with unusual challenges at times like this. To Mrs. Swain’s Family, I was a nurse who looked after your Mom when she was seriously ill about thirty years ago. She was such a lovely woman and a special patient, a pleasure to look after. She also made awesome fudge, as I’m sure you all remember. I am so sorry for your loss. To the Swain Family; I only knew your Mom for a short time, but loved chatting with her. She always had a smile and I am glad to have met her when she had her short stay at the Nursing Home. I always enjoyed the visit as we did her exercises. She never complained and I am sure she will be greatly missed. Please except our condolences. To the Swain Family: I want to extend my condolences to the family. Frances’ cousin from British Columbia.